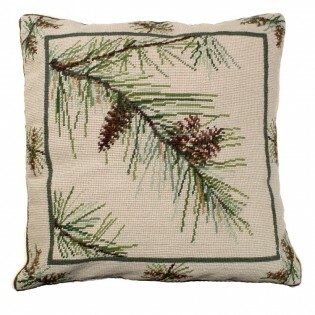 The bough from a pine tree sits on a beige needlepoint back. Realistic pine cones sit upon the bough. A hunter green border surrounds the edge of this pillow. Its almost as if you can smell the scent of pine in the air on a cool autumn day. The Pine Bough Needlepoint Pillow is great in any room or home.